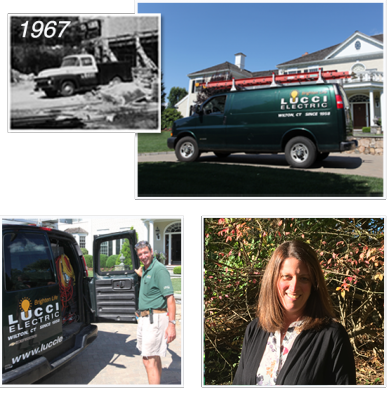 Lucci Electric, Incorporated, in Wilton, Connecticut, has been proudly serving Fairfield County homes and businesses for over 50 Years with the highest quality service and workmanship. We remain true to that heritage as we evolve our expertise to meet all your electrical needs in today’s high tech world while remaining focused on you, the customer. Under the leadership of our President, Christopher Reeb (pictured at right), our team will arrive with our fully equipped vehicles ready to exceed your expectations. Our Business Manager, Dawn Mele (pictured at right) is ready to brighten your day with prompt scheduling, and unsurpassed customer service. Lucci Electric is a strong supporter of the local community as we consistently offer our support through donations of time and materials, as well as contributing and participating in various local events and programs. I want to thank you and your team for all the electrical work done at our house. The Lucci team did a great job! We were so happy when our power came back throughout the house. I feel very lucky to have called you the morning of our fire. You’re quick reply made a huge difference after such a traumatic family event. Everyone was very professional and helpful. Overall, we feel very fortunate and Lucci Electric was a major contributor!